It’s the little things you don’t see. He stands a few feet behind the bag at third, spikes lazily grooming the dirt beneath his Nikes, and exhales. A slap of the glove combined with two steps forward, and he’s in the “circle.” Just as quickly—as soon as the pitch reaches the catcher’s mitt – he’s out of it. It’s the little things that aren’t spoken. Remember your breathing. Don’t worry about the results. Stay in the moment. Prepare to get a hit. It’s the little things that made all the difference for Tampa Bay Rays third baseman Evan Longoria. You’ve heard of him. He’s the kid who broke onto the big league scene last May, immediately signed a nine-year deal worth up to $44 million to become the face of the franchise, and then went on to crush 27 homers and win the A.L. Rookie of the Year Award. The same kid that was taunted relentlessly last October, as chants of “Eeeevvaaaa” sprinkled down from the cold Philadelphia sky. It’s been quite a rush for Longoria. Mere months after being called up, he found himself at Yankee Stadium competing in the home run derby and All Star Game. Not even two full seasons into his bright big league career, Longoria has been to two Mid Summer Classics, donned ‘USA’ across his chest in the World Baseball Classic, and experienced the Fall Classic. Some may not be surprised by the accomplishments of the burgeoning superstar, but for a guy as gifted as Longoria, it never had the makings of a classic beginning. Jeremy Schaap of E:60, the ESPN prime-time news magazine program, did a feature on Longoria this week that was far superior to anything we have seen thus far on the ballplayer (E:60 airs Tuesday’s at 7:00 PM EST, and is a must-Tivo for anybody who loves sports or investigative journalism. Pound for pound, E:60 is the best show ESPN has on its docket, outside of live broadcasts). Even Schaap was baffled by how a kid could go that unnoticed, only to be tearing up the big leagues six years later. Without many options, Longoria took his supreme desire and work ethic to Rio Hondo, a junior college not far in Whittier, CA. After hitting .430 as a freshman at Rio Hondo, Mike Weathers, the head coach at Long Beach State, offered Longoria a scholarship, and he became a Dirtbag. Longoria was moved to third base as a sophomore at Long Beach State, not because he couldn’t handle shortstop, but because Weathers already had his starter at there. That guy was junior Troy Tulowitzki, now with the Colorado Rockies. Longoria went on to hit .320 that year and earn All-Big West Conference honors, but nothing that happened on the field was as important as what happened off of it. Longoria was introduced to kinesiology professor Ken Ravizza. Ravizza is an author of sports psychology books and is a sports psychology consultant who has been hired to work with numerous Division 1 programs and professional organizations. Ravizza preaches mental preparation and structure, and teaches athletes how to deal with, and not dwell on, failure. Failure is unavoidable, says Ravizza, so he prefers to use it as a teaching tool. If it sounds that simple, well, it’s not. Ravizza speaks to hundreds and hundreds of ballplayers every year, and it takes a special and intuitive kid to believe in Ravizza’s methods and consciously apply them. Many youngsters don’t quite get the impact that an improved mental outlook can have on their careers, or they simply don’t want to, and therefore never benefit from it. But Longoria was different from the moment Ravizza began speaking, and Ravizza believes his acceptance of the mental side of competition is what has allowed him to grow so much so quickly. 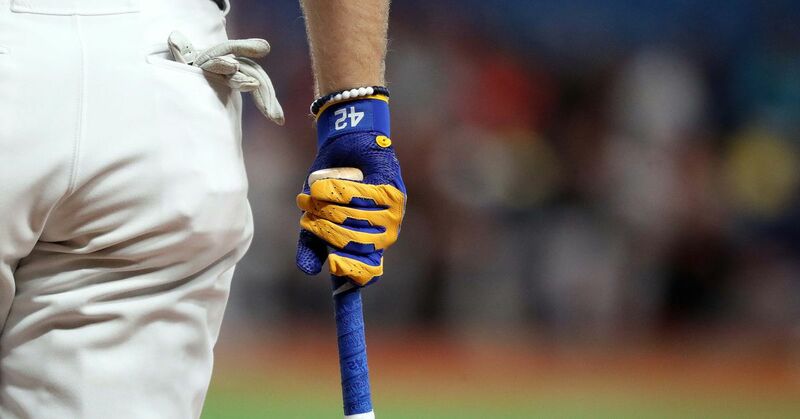 When you are putting on your batting gloves, put on your batting gloves. When you step into the box, step into the box. Be where you need to be when you need to be there. But once Longoria moved past that doubt, he realized the beauty in Ravizza’s direct thought. That was the birth of the routine that has carried Longoria all the way to Tampa Bay. Ravizza spoke to Longoria about establishing a “focal point,” a point of reference around the stadium he can look at to refocus his mind during a game. Longoria’s focal point is the top of the left field foul pole “just because I know there is always going to be a top of the left field foul pole.” At the plate, Longoria will step out of the batter’s box and undo his batting gloves to “release” a pitch that he felt he should have hit but missed. In the field, the imaginary “circle” is a way of intently focusing the mind for a couple seconds at a time while the pitch is being thrown. If Longoria isn’t playing that day, he will periodically put on his batting gloves in the dugout and visualize himself hitting. All of this is meant to give Longoria his best chance at success, but also a vehicle for controlling his emotions and frustrations when he doesn’t succeed. Some players scoff at such practices, but this inner strength became pivotal when Longoria saw himself go 1-for-20 in the World Series last year, admitting that “the game kind of sped up on me and I let some outside distractions in.” Some players break bats, helmets, walls, and fists because they don’t understand to deal with the natural feeling of disappointment. From afar, it appears that the game comes easy for Longoria, like he was born to play it. And he was, but it’s the intangibles that allow him to do so. “His ability to be in the present moment makes him one of the best,” Carlos Pena said about his teammate. If you would have asked Longoria six years ago if he would be play in the big leagues, there’s no way he would have admitted to believing so. Not many even thought quite a notion. As scouts began to drool over his physical tools when he spent the summer of 2005 earning the Cape Cod League MVP Award, Longoria continued to hone the inside. While the rest of us see the polish and the shine that comes with Longoria’s game, the slugger keeps it simple. If it weren’t for Ravizza and the little things, there may not have ever been a big league circle for Longoria to step into. You can reach Teddy Mitrosilis at tm4000@yahoo.com.